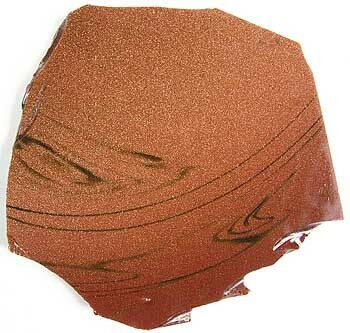 Goldstone is a manmade stone that is actually glass with flecks of copper in it. 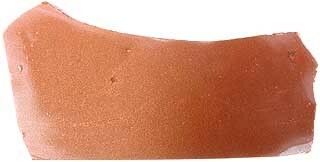 Goldstone cuts easily and polishes well with tin or cerium oxide. Typical Red Goldstone Slab and one with grayish markings. Measures approximately 3-1/2" x 3" x 9/32" thick. Note: Has abstract grayish markings in the center and corner of the slab. Red Goldstone Slab Measures approximately 3-1/2" x 3-1/2" x 7/32 to 3/16" thick. Note: Has a small amount of grayish markings on 1/3 of slab. Measures approximately 3-5/8" x 2-7/8" x 9/32" thick. Note: Has a small amount of grayish markings. Two piece parcel measuring approximately 3-1/2" x 2" x 9/32" thick and a triangular piece at 4" x 3-1/4" x 9-32" thick. Note: Have a grayish markingsin the center and on one edge. Two piece parcel measuring approximately 3-1/2" x 2-1/2" x 7/32" thick and 3" x 2-1/8" x 1/4" thick. Note: One slab has a small amount of grayish markings and the other a double stripe of gray. Two piece parcel all measuring approximately 3-5/8" x 1-3/4" x 1/4" thick and 2-1/4" x 2-1/8" x 5/16" thick. Note: Slabs have some abstract grayish markings. Two piece parcel all measuring approximately 3-1/2" x 1-7/8" x 7/32" thick and 2-3/8" x 2-1/4" x 7/32" thick. Note: Slabs have a small amount of grayish markings. Two piece parcel all measuring approximately 2" x 2" x 3/16" thick and a triangular slab at 3-1/2" x 3" x 3/16" thick. Note: Slabs have some abstract gray markings.